A retreat in the best sense vintage house freshly scribes its signature to a vibe that pulls from the rich Napa narrative mixed with a distinctly modern tone to define a refined contemporary vino-cultured sanctuary. drawing from the poetry of its place vintage house is an inspired haven for drinking in the rhythms and verse of the Napa valley with its bungalow-style abodes tucked quietly amidst the lush landscape of the estate barely a heartbeat from the beloved town of Yountville. 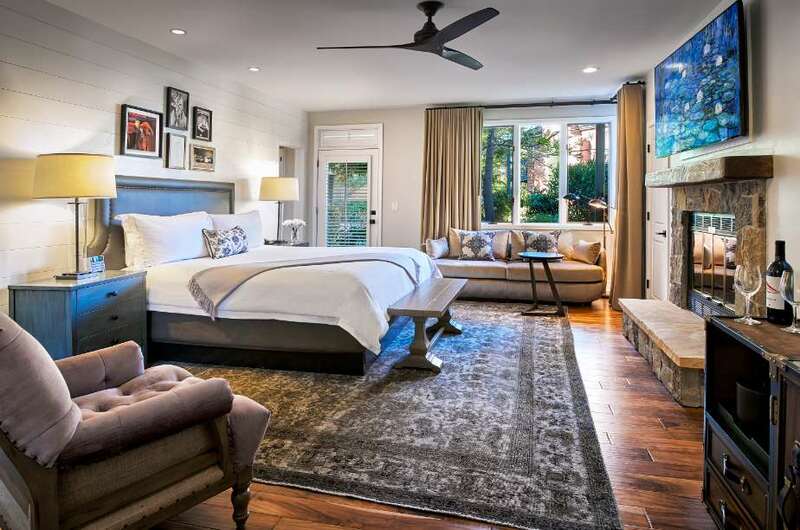 from a lobby that brings luxe farmhouse style into present day focus to fire-placed guestrooms that resolve to sophisticated varietal hues and bespoke details that resolutely reference their locale everything is tastefully filled with the rich flavor of the wine country. enchantment is on the agenda everywhere with a pool zone splashed in serenity and a sought-after espa experience just down the path. as part of the estate the stylish new centerpiece of the town the wonderful is walkable so you can curate a day around discovering local appellations and world-class shopping gallery hops and artful experiences end capping with a celebrity chef prepped dinner or night cap at the buzzy hotel villagio bar. a colorful new chapter in Napa hospitality this is vintage house.